本主题概述了如何使用调试器数据模型 c + + 接口来扩展和自定义调试器的功能。This topic provides an overview of how to use Debugger Data Model C++ Interfaces to extend and customize the capabilities of the debugger. 本主题包含以下部分：This topic includes the following sections. 为了说明调试器数据模型的目标，请考虑此传统的调试器命令。To illustrate the goals of the debugger data model, consider this traditional debugger command. DirBase: 1f7fb9000  ObjectTable: ffffc001cec82780  HandleCount:  34. 调试程序命令正在使用的二进制掩码，它提供了非标准方式仅输出的文本。The debugger command is using a binary mask and it provides text only output in non-standard ways. 难以使用、 设置格式，或扩展的文本输出，布局是特定于此命令。The text output is difficult to consume, format, or extend and the layout is specific to this command. 调试器数据模型相比这dx （显示调试器对象模型表达式）命令。Contrast this to the debugger data model dx (Display Debugger Object Model Expression) command. 此命令使用标准的数据模型的可发现、 可扩展和可组合以统一的方式。This command uses a standard data model that is discoverable, extensible and composable in uniform ways. 逻辑上间距内容和扩展对特定对象的名称允许调试器扩展功能的发现。Logically name spacing things and extending on specific objects allows for the discovery of debugger extension functionality. 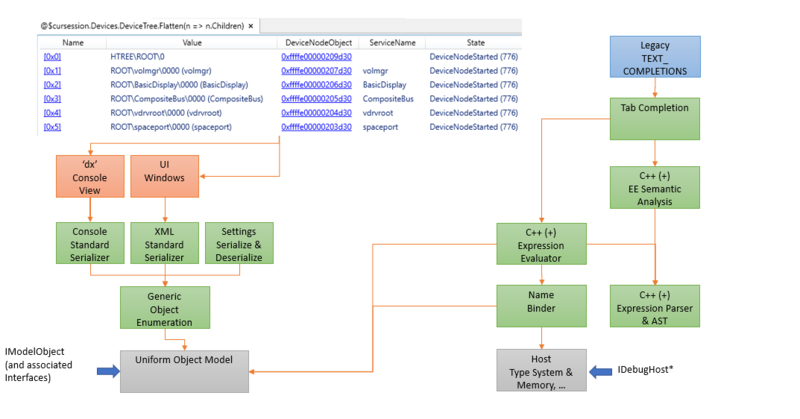 数据模型是方法的新WinDbg 预览调试器，显示的大多数情况。The data model is the way that the new WinDbg Preview debugger, shows most things. 可以查询、 扩展，或编写脚本，因为它们由数据模型驱动新的用户界面中的许多元素。Many elements in the new UI can be queried, extended, or scripted, because they are powered by the data model. 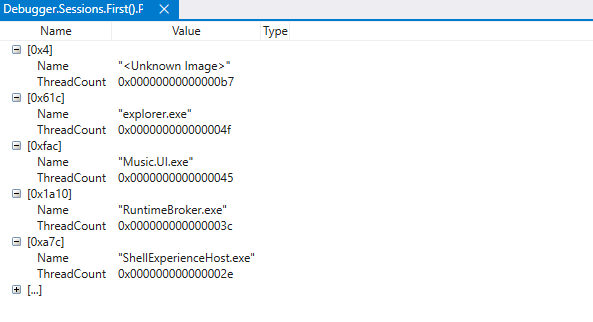 有关详细信息，请参阅WinDbg 预览版-数据模型。For more information, see WinDbg Preview - Data Model. 下图总结了调试器的数据模型体系结构的主要元素。The following diagram summarizes the major elements of the debugger data model architecture. 到左侧和右侧，显示 UI 元素，提供对象的访问权限和支持 LINQ 查询与此类功能。To the left side, UI elements are shown that provide access to the objects and support such functionality as LINQ queries. 调试器数据模型的中心是所有内容都是 IModelObject 接口的实例在其中一个统一的对象表示形式。At the center of the Debugger Data Model is a uniform object representation in which everything is an instance of the IModelObject interface. 虽然此类对象可能表示内部函数 (例如： 一个整数值) 或另一个数据模型接口，它通常表示动态对象 – 元数据键/值元组的字典和一组描述抽象行为的概念。While such an object may represent an intrinsic (e.g. : an integer value) or another data model interface, it often represents a dynamic object – a dictionary of key/value/metadata tuples and a set of concepts which describe abstract behaviors. 下图显示了 IModelObject 如何使用密钥存储包含一个提供程序可以创建、 注册和操作的值。This diagram shows how the IModelObject uses Key Stores to contain values that a provider can create, register and manipulate. 它显示在左侧IModelObject，即通用对象模型，用于操作对象。On the left it shows the IModelObject, that is the common object model that is used to manipulate objects. 在中心非常密钥存储用于存储和访问值。In the center is the Key Store that is used to store and access values. 它显示在底部概念对象支持的功能，例如将转换为可显示字符串或要编制索引的功能。At the bottom it shows Concepts that support objects with functionality such as the ability to convert to a displayable string or be indexed. 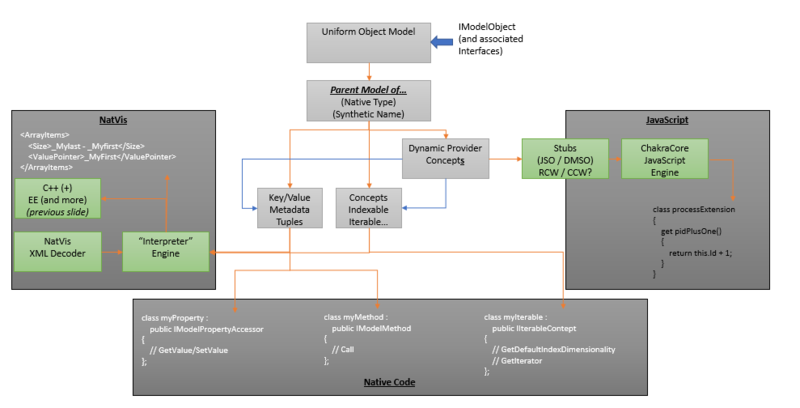 下图显示了数据模型的使用者视图。The next diagram shows a consumer view of the data model. 在示例dx （显示调试器对象模型表达式）命令用于查询的信息。In the example the dx (Display Debugger Object Model Expression) command is being used to query information. Dx 命令通过对对象的枚举接口的序列化程序进行通信。The Dx command communicates through a serializer to the object enumeration interface. IDebugHost * 对象用于从调试器引擎中收集信息。IDebugHost* objects are used to gather information from the debugger engine. 使用表达式和语义的评估者将请求发送到调试器引擎。Expression and semantic evaluators are used to send the request to the debugger engine. 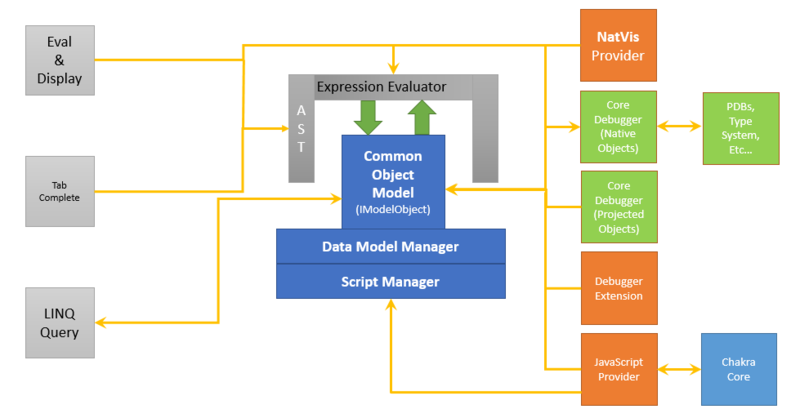 此图显示了数据模型的生成者视图。This diagram shows a producer view of the data model. NatVis 提供程序显示在左侧使用 XML 定义其他功能。A NatVis provider is shown on the left that consumes XML that defines additional functionality. 底部显示的本机代码提供程序还可以定义其他功能。The bottom shows a native code provider that can also define additional functionality. 下图显示了中心角色对象的管理中起着数据模型管理器。This diagram shows the central role that the data model manager plays in the management of objects. 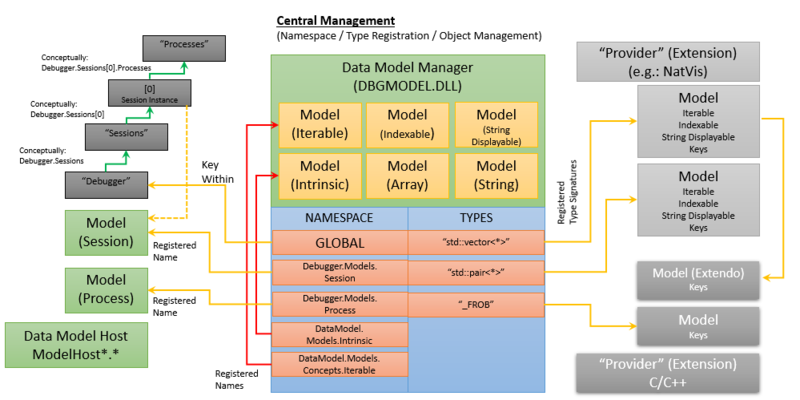 数据模型管理器充当中心的注册机构的所有对象。The Data Model Manager acts as a central registrar for all objects. 在左侧它显示如何标准调试器元素，如注册会话和进程。On the left it shows how standard debugger elements such as sessions and process are registered. 命名空间块显示了中央注册列表。The namespace block shows the central registration list. 关系图的右侧显示底部的两个提供程序，一个用于在最前面，NatVis，C/c + + 扩展。The right side of the diagram shows two providers, one for NatVis on the top, and a C/C++ extension on the bottom. 数据模型管理器是用于管理的核心组件如何发生的所有可扩展性。The Data Model Manager is the core component which manages how all extensibility occurs. 它是一组表映射到扩展点，以及对扩展点的综合构造这两种本机类型的中央存储库。It is the central repository of a set of tables which map both native types to extension points as well as synthetic constructs to extension points. 此外，它是负责对象 （的序号值或字符串到 IModelObject 的转换） 的装箱的实体。In addition, it is the entity which is responsible for the boxing of objects (conversion of ordinal values or strings into IModelObject's). 数据模型还具有哪些脚本，以及如何调试一个一般概念。The Data Model also has a general notion of what a script is and how to debug one. 它是完全有可能的调试器扩展出现并定义数据模型和另一种动态语言 （通常是一个脚本编写环境） 之间的常规桥梁。It is entirely possible for a debugger extension to come along and define a general bridge between the data model and another dynamic language (usually a scripting environment). 此组接口是如何完成此操作以及如何调试程序 UI 可使用此类脚本。This set of interfaces is how that is accomplished as well as how a debugger UI can make use of such scripts.